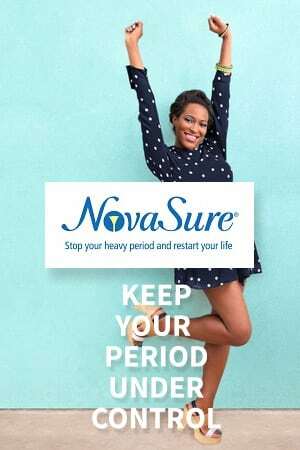 Say no more to heavy periods, we can help take control of heavy menstrual bleeding. They are many treatments and options for heavy menstrual bleeding. During your consultation our gynecologist will assess the severity of your period by noting your menstrual history and asking to you begin keeping records. The treatment for heavy periods vary and in some cases require minimally invasive surgery or procedures. One of our most common minimally invasive surgery options for the treatment of heavy periods is called Novasure. What is the NovaSure procedure and recovery like? NovaSure® endometrial ablation is the simple, one-time, 5 minute procedure trusted by over one million women that helps to lighten or stop heavy menstrual bleeding – without hormones or hysterectomy. Where is NovaSure procedure performed? How long does the NovaSure procedure take? How quickly will I recover following the NovaSure endometrial ablation procedure?